Save the Misamis Occidental Capitol in Oroquieta City! It's Architect Juan Arellano's week unfortunately! Another significant work of Juan Arellano could disappear if we do not put a stop to this nonsense. Architect Dom Galicia received a report early this week that the side wings of the prewar Misamis Occidental Capitol Building in Oroquieta City are being demolished. The Provincial Government of Misamis Occidental is violating Republic Act No. 10066 - National Cultural Heritage Act of 2009. Seeing an old photo of the capitol, Architect Toti Villalon notes, "What a beautiful Palladian structure the original was." Here we go again! This time the local government is the proponent of the demolition! We appeal to Gov. Herminia Ramiro to stop this massacre of great architecture. We call on the people of Misamis Occidental to help us send the message across. Thank you Gov. Herminia Ramiro! Here is the recent update from Archt. Dom Galicia: To balance out the terrible news coming from the City of Manila, here is a long-delayed report on the March 28, 2012, meeting at the NCCA with the governor of Misamis Occidental regarding the fate of the Juan Arellano-designed capitolio. Attendees were: NCCA Executive Director Emelita Almosara; Gov. Herminia Ramiro of Misamis Occidental; Arch. Raj Busmente, NCCA; Arch. Nelson Aquino, National Museum; Arch. Wilkie de Lumen, NHCP; Arch. EM Cuerpo and two members of his architectural team from the design-build firm of EM Cuerpo; Atty. Trixie Cruz Angeles, NCCA Legal Counsel; Ms. Kat Anuta, NCCA; Arch. Dominic Galicia, NCCA-NCMS. After a lively yet cordial deliberation, direction was established regarding how best to respect and sustain the exemplary cultural and historical value of the capitolio, which served as the capital of a Free Philippines in the early days of World War 2. Gov. Ramiro instructed the EM Cuerpo design-build team to follow the NCCA recommendation to restore the Juan Arellano capitolio (including restoring the Great Hall, now subdivided into two floors and attic) and to house the expansion in a new separate structure to be built in the back. The new structure will act as a quiet background building, perhaps employing the lightness and transparency of green architecture. The Juan Arellano capitolio could one day house the provincial museum, of which there is none so far. The Great Hall could one day be used as the Session Hall. EM Cuerpo will submit three schemes for Gov. Ramiro's approval, with NCCA consultation. EM Cuerpo raised concerns about the legal and Commission-on-Audit ramifications of the change in the design and the terms of reference. NCCA Legal Counsel Trixie Cruz Angeles allayed those concerns by explaining the power of the Heritage Law. NCCA would be preparing a letter to Gov. Ramiro which will serve as a document of rationale. It was a remarkable demonstration of political will, once Gov. Ramiro made the decision to restore the capitolio and build a separate annex in the back. Generations will remember this decision of Gov. Ramiro. Not just Misamis Occidental, not just Mindanao, but the nation as a whole will be grateful. I am actually also disturbed with the sign atop the building. Where is the separation of the church and state? If they're gonna build a new and better structure kahit walang history, I'm ok with the demolition. Actually, the Capitol Building will be preserved. Only the side wings will be re-structured. @itin, That was such a nationalistic comment! You do love our country and its heritage! @ anonymous...the side wings of the stately building is part of the whole building!!!! if you restructure the wings you are destroying the whole building, ou are going to destroy our heritage!!! please build somewhere else!!!! i like the old building preserved. it has a historical value. new buildings maybe built behind it. Alam na kaya ito ng NCCA? Dapat ipaalam agad. Saka sana maliwanagan ang taumbayan sa Oroquieta City and Misamis Occidental province of the value of our provincial building. The question is how much money is going to be spent for this "renovation"? I heard that they are making a loan of 200 plus million. This is outrageous!!! I hope this info is wrong.. Otherwise, their is indeed a number of people who have personal monetary gain in this project. Wake up people!!! Where's the "SUNDIN ANG DA-ANG MATUWID". GOD HELP US!!! RESTORATION NOT DEMOLITION OR RE-STRUCTURING! tan-awa daw unsa'y background sa mga tawo na naka-idea ani... basin wala sila ka eskwela intawon ug husto..pero opisyales man nato sila..na botang lang sila sa pwesto kay ang mga pobre na mga ignorante intawon na palit man ilang boto...looy intawon ang mga pobre...sila man pabayron aning "renovation" ... gutom ang kadaghanan...busog ang nasa pwesto...it's more fun in the PHILIPPINES! Let us help preserve our cultural heritage. 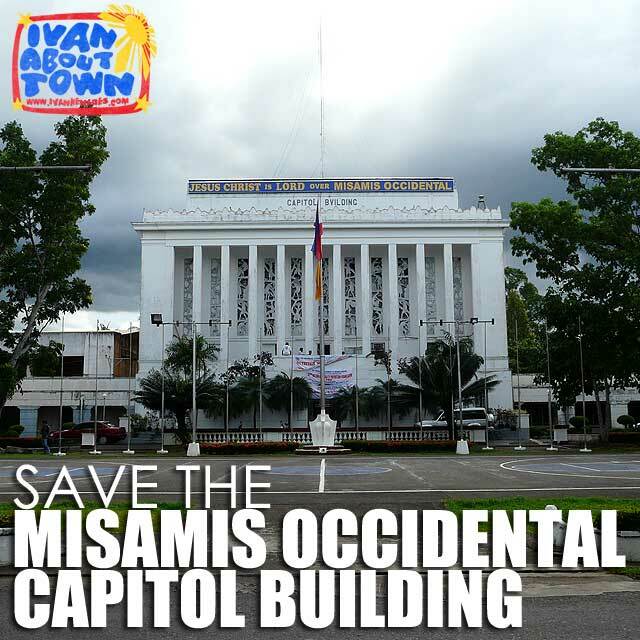 Save Misamis Occidental Capitol Building. This is a landmark, why demolish? Renovation perhaps is acceptable but to change everything that is against RA 10066! i think ang mga tawo sa kapitolyo dman pd cguro na cla bugo, mas bugo ng mi comment lng ug negative na wala kabalo ug unsay buhaton sa kapitolyo. dont you know na grabe na ang leak sa capitolyo during rains? dont you know that the last earthquake, naay nangakita na new cracks sa main building? dont u know that daghan ng daot sa kapitolyo because its no longer conjusive for working? dnt u knw that majority of the capitol employes support this move? dili demolition ang ako pagsabot kndili restoration ang mahitabo with additional new building sa likod not the whole building will be demolished! Again, whatever the plans are and how many support it, we all have to respect the law. RA10066 requires the LGU to get approval from the NCCA before it can touch or even demolish the wings of a heritage building like the Misamis Occidental Capitol. - Hoy ! ma looy mo sa mga tawo na nag tarbaho sa Capitolyo oy..serbisyo baya mi na totoo. .unsa man ng cultural heritage...ma kaon na? among gusto na dili na mi ma basa ug kusog ulan, importante na... we love Mommy Hermie! mahal kaayo siya! aw Mahal namin siya diay ! maayo kaha mo react ta dayon maski wala ta kabalo ug unsay purpose. ?..makisayod sa seguro ta..
OMG !!! WHO HAS THE NERVE TO EVEN THINK OF ALTERING THE ORIGINAL DESIGN THIS BEAUTIFUL CAPITOL BUILDING!!! Com'mon people! THIS IS JUST TOO PAINFUL...where are our enlightened citizens? can't believe this is happening in my lifetime...SO SAD!!! Just construct a new building, period. Basin mas cheaper pa. Then vacate the Capitol building and we can start talking about renovation. himuon na lang nga museum na. (g) Archival material/document dating at least (50) years old. The property owner may petition the appropriate cultural agency to remove the presumption of important cultural property which shall not be unreasonably withheld. Sec. 7. Privileges for Cultural Property. - All cultural properties declared as national cultural treasures and national historical landmarks, sites or monuments shall be entitled to the following privileges. (d) In times of armed conflict, natural disasters and other exceptional events that endanger the cultural heritage of the country, all national cultural treasures or national historical landmarks, sites or monuments shall be given priority protection by the government. All cultural properties declared as important cultural property may also receive government funding for its protection, conservation and restoration. An official heritage marker shall likewise be placed on an immovable cultural property to identify the same as important cultural property. @anonymous... for the purpose of being nationalistic, can't you at least write your comment in Filipino or English? Talk about Regionalistic Parochialism. Why don't you have a concensus of the whole citizenry of your province if they agree with the Capitol Employees. Righting a problem by another problem is not only STUPID but downright SHORT SIGHTED. If the roof is leaking, then build another roof? Why tear the whole annex down? If there are cracks in the walls, then have the engineering team inspect it to see if it should be condemned. Why do you need to cut off your arm when you only need to put a cast? Your IGNORANCE is really FRUSTRATING. I hope its not epidemic to all Capitol employees of your far flung province. Thanks a lot Mr Ivan Henares for putting the limelight on our beautiful capitol! This gives us a sense of history - whatever the arguments are - for or against the demolition or restoration. Please let us unite to preserve this treasure. On your far right of the blog - ABOUT IVAN HENARES - consulant lacks a t - it should read consultant, right? pareho lang ta tanan nga nanghinaot nga maplastar ang atong kapitol. ang ato lang gipanghinaot nga tarungon ug trabaho kay matawag na nato na nga bahandi sa atong probinsya. para sa akoa, dili ko mobabag sa pag-usab ni-ana basta matuman lang jud ang mga proseso ug ang kada proseso walay mga tinonto nga maagi-an..
PEOPLE! Before you post your nonsense comments and reactions, PLEASE READ WHAT IS BEING POSTED IN THE UPPER PART OF THIS PAGE. IT STARTS WITH... Thank you Gov. Herminia Ramiro! Personally, I vouch with the competence of our lady governor. With her present age and as a mother, I do believe she is after of the welfare of the people. As early as after her election to office, she has initiated, started and fully implemented some of her flagship programs. Look at the Grandstand and among others, these were not given due concern by your past "well-loved provincial officials". Before you comment, you have to KNOW, THINK, WEIGHT and JUDGE because you might let your poor brain out. Governor have CONSULTED and have GIVEN DUE CONSIDERATION of the suggestion of NCCA. People of Oroquieta City, we have to be happy that even if our governor is from the 2nd District she has properly divided the resources of our province and not just focus on one district for any future political advances. THINK OF IT! I am from Oroquieta City and actually connected with NCCA. I also did not vote for Madame Ramiro last election but I have the nerves to say that she has brought and will bring more progress to our province. I salute for her openness when she attended the conference with NCCA. Nagpapasalamat ako sa ating Gobernadora at siya ay nakinig at gumabay sa batas... dapat lang kung siya ay maging isang tunay na lider ng mga taga Misamis Occidental. Sana ang kanyang mabigat na responsibilidad sa pag serbe sa ating probinsya ay mamalaging "puro at sincero" para mabigay niya ito bilang pamana sa mga taga Misamis Occidental. Kung isipin mo, tayo ay mapalad na ang talagang taga Cavite ay napunta dito sa lupang Mindanao at ginamit ang sagradong pagkataong mag silbe sa ibang bahagui ng Pilipinas. Sana maging mabuting ejemplo ka Madame Governor, sa lahat ng nasa pwesto sa gobyerno at ma ala ala naman nila ang totoong dahilan kung bakit sila ay naging "public official." Ibahin na nating ang pagtinging ng isang " government official" sa makakaawang bansang Pilipinas... maging instrumento naman tayo sa pag bangon ng bawa't Pilipino !!! Kaya natin to !!! Oroquieta City will not progress unless they adopt the modern strategy in economics.The structure will remind us old fashion,not firm,&others.It symbolize of weak leader,no strategic way of improving the lives and economy of the people there.Wake up Governor,Mayor of Oroquieta.Open your place to every investor!